The highest levels of box lacrosse are the National Lacrosse League (NLL) (professional), Interstate Box Lacrosse Association (semi-pro), Senior A divisions of the Canadian Lacrosse Association (semi-pro), the Western Lacrosse Association (semi-pro), and Major Series Lacrosse (semi-pro). 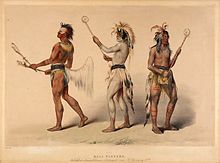 Ball players, painted by George Catlin, illustrates various Native Americans playing lacrosse. Briefly in 1939, a professional box lacrosse league started up in California, called the Pacific Coast Lacrosse Association. This four team league also folded shortly after opening. Professional box lacrosse did not return to the United States again until 1968 when the Portland Adanacs and Detroit Olympics franchises played in the National Lacrosse Association, a circuit that folded after one summer season. At the officials' discretion a ten-minute misconduct penalty may be assessed. These are served in full by the penalized player, but his team may immediately substitute another player on the playing area unless a minor or major penalty is assessed in conjunction with the misconduct (a "two-and-ten" or "five-and-ten"). In that case, the team designates another player to serve the minor or major; both players go to the penalty box, but only the designee may not be replaced, and he is released upon the expiration of the two or five minutes. In addition, game misconducts are assessed for deliberate intent to inflict severe injury on an opponent. A player who receives a game misconduct is ejected and may not return to play. Receiving two major penalties in a game risks a game misconduct. ^ "1931 International Lacrosse Federation Game Program". Wamper's Bible of Lacrosse. Retrieved 2015-10-25. ^ "M.C.C. STILL UNDEFEATED". The Australasian. Melbourne. 27 June 1931. p. 49. Retrieved 24 October 2015 – via National Library of Australia. ^ "LACROSSE". The Argus. Melbourne. 9 June 1931. p. 13. Retrieved 24 October 2015 – via National Library of Australia. ^ "LACROSSE". The Australasian. Melbourne. 11 July 1931. p. 50. Retrieved 24 October 2015 – via National Library of Australia. ^ "LACROSSE". The Telegraph (FIRST EDITION ed.). Brisbane. 4 September 1931. p. 12. Retrieved 24 October 2015 – via National Library of Australia. ^ "LACROSSE". The West Australian. Perth. 24 May 1932. p. 14. Retrieved 26 September 2012 – via National Library of Australia. ^ "LACROSSE". The West Australian. Perth. 14 June 1932. p. 14. Retrieved 26 September 2012 – via National Library of Australia. ^ "UNJUSTIFIED CRITICISM OF LACROSSE REFEREES". The Advertiser. Adelaide. 10 June 1932. p. 11. Retrieved 26 September 2012 – via National Library of Australia. ^ "LACROSSE". The Brisbane Courier. 4 July 1933. p. 7. Retrieved 26 September 2012 – via National Library of Australia. ^ "LACROSSE". Western Mail. Perth. 27 July 1933. p. 19. Retrieved 26 September 2012 – via National Library of Australia. ^ "LACROSSE". The West Australian. Perth. 5 July 1932. p. 4. Retrieved 26 September 2012 – via National Library of Australia. ^ "WLA Lacrosse Association". British Columbia Lacrosse Association. Archived from the original on April 9, 2008. Retrieved 2008-11-04. ^ "Major Series Lacrosse". Ontario Lacrosse Association. Archived from the original on 2009-06-09. Retrieved 2008-11-04. ^ "NLL Pro Stats: 1974 and 1975". Wamper's Bible of Lacrosse. Archived from the original on February 14, 2009. Retrieved 2008-11-04. ^ a b c d e f g h i j k l m n "National Lacrosse League Rulebook" (PDF). NLL.com. Archived from the original (PDF) on 2008-12-17. Retrieved 2008-10-27. ^ "What's the Deal With Box Helmets? Archived April 7, 2014, at the Wayback Machine" Lacrosselime.com. 25 February 2014. Retrieved March 3, 2014. ^ a b c d "Canadian Lacrosse Association has developed the Parents and Players Guide to Box Lacrosse" (PDF). Canadian Lacrosse Association. Archived from the original (PDF) on October 25, 2006. Retrieved 2008-11-04. ^ "2008 National Lacrosse League Media Guide" (PDF). NLL.com. Archived from the original (PDF) on 2008-10-31. Retrieved 2008-11-06. ^ "Floor Diagram and Line Markings for CLA Play" (PDF). Canadian Lacrosse Association. Archived from the original (PDF) on March 4, 2009. Retrieved 2008-11-04. ^ "Canadian Box Lacrosse Rules" (PDF). Nepean Knights Minor Lacrosse Association. Archived from the original (PDF) on 2007-07-10. Retrieved 2008-11-10. ^ "Williamstown Lacrosse Club history". Williamstown Lacrosse Club. Archived from the original on 2009-02-13. Retrieved 2008-11-06. ^ "Baltimore Indoor Lacrosse League". Baltimore Indoor Lacrosse League. Archived from the original on 2009-02-14. Retrieved 2008-10-31. ^ "2003 World Indoor Lacrosse Championships". Outsider's Guide. Archived from the original on 2009-02-15. Retrieved 2008-11-04. ^ "WILC 2015". Archived from the original on 2015-02-15. Retrieved 2015-11-29. ^ Elliot, Danielle (24 September 2015). "Native America's Team: four Onondaga brothers shatter records and perceptions". Guardian (UK). ^ "WILC 2015". Federation of International Lacrosse. Retrieved 15 November 2017. ^ Joe, Fee (October 5, 2002). "American outburst rocks Canadians in Heritage Cup". Outsider's Guide. Archived from the original on February 14, 2009. Retrieved 2008-11-04. ^ Philly, R.A. (October 16, 2004). "Canadians swipe Heritage Cup, 17-8". Outsider's Guide. Archived from the original on February 15, 2009. Retrieved 2008-11-04. ^ "Ontario Girls Box Lacrosse Website". OntarioGirlsBoxLacrosse.com. Archived from the original on 2009-02-13. Retrieved 2008-11-06. ^ "BC Women's Lacrosse Website". BCWomensLacrosse.com. Archived from the original on 2009-02-13. Retrieved 2008-11-06.